San Antonio serves as the seat of Bexar County. The city has characteristics of other western urban centers in which there are sparsely populated areas and a low density rate outside of the city limits. San Antonio is the center of the San Antonio–New Braunfels Metropolitan Statistical Area. Commonly referred to as Greater San Antonio, the metropolitan area has a population of over 2.27 million based on the 2013 US Census estimate, making it the 25th-largest metropolitan area in the United States and third-largest in the state of Texas. Growth along the Interstate 35 and Interstate 10 corridors to the north, west and east make it likely that the metropolitan area will continue to expand. San Antonio was named for Saint Anthony of Padua, whose feast day is on June 13, by a 1691 Spanish expedition in the area. It is notable for Spanish colonial missions, the Alamo, the River Walk, the Tower of the Americas, the Alamo Bowl, and Marriage Island. Commercial entertainment includes SeaWorld and Six Flags Fiesta Texas theme parks, and according to the San Antonio Convention and Visitors Bureau, the city is visited by about 26 million tourists a year. The city is home to the five-time NBA champion San Antonio Spurs and hosts the annual San Antonio Stock Show & Rodeo, one of the largest such events in the country. The US armed forces have numerous facilities in San Antonio: Fort Sam Houston, Lackland Air Force Base, Randolph Air Force Base (which constitute Joint Base San Antonio), and Lackland AFB/Kelly Field Annex, with Camp Bullis and Camp Stanley located outside the city. Kelly Air Force Base operated out of San Antonio until 2001, when the airfield was transferred to Lackland AFB. The remaining portions of the base were developed as Port San Antonio, an industrial/business park. San Antonio is home to six Fortune 500 companies and the South Texas Medical Center, the only medical research and care provider in the South Texas region. In a series of battles, the Texian Army succeeded in forcing Mexican soldiers out of the settlement areas east of San Antonio, which were dominated by Americans. Under the leadership of Ben Milam, in the Battle of Bexar, December, 1835, Texian forces captured San Antonio from forces commanded by General Martin Perfecto de Cos, Santa Anna's brother-in-law. In the spring of 1836, Santa Anna marched on San Antonio. A volunteer force under the command of James C. Neill occupied and fortified the deserted mission. In 1845, the United States finally decided to annex Texas and include it as a state in the Union. This led to the Mexican-American War. Though the US ultimately won, the war was devastating to San Antonio. By its end, the population of the city had been reduced by almost two-thirds, to 800 inhabitants. Bolstered by migrants and immigrants, by 1860 at the start of the Civil War, San Antonio had grown to a city of 15,000 people. San Antonio is located near 29.5°N 98.5°W. It is about 75 miles to the southwest of its neighboring city, Austin, the state capital. The city is also about 190 miles west of Houston and about 250 miles south of the Dallas–Fort Worth area. According to the U.S. Census Bureau, in 2000 the city had a total area of Script error: No such module "convert".—Script error: No such module "convert". (98.9%) of land and Script error: No such module "convert". (1.1%) of water. The city sits on the Balcones Escarpment. The altitude of San Antonio is Script error: No such module "convert". above sea level. The primary source of drinking water for the city is the Edwards Aquifer. Impounded in 1962 and 1969, respectively, Victor Braunig Lake and Calaveras Lake were among the first reservoirs in the country built to use recycled treated wastewater for power plant cooling, reducing the amount of groundwater needed for electrical generation. San Antonio has a transitional humid subtropical climate (Köppen: Cfa). The weather is hot in the summer, comfortably warm or mild winters subject to descending northern cold fronts in the winter with cool to cold nights, and warm and rainy in the spring and fall. Dewpoints in the summer months average at around Script error: No such module "convert"..
San Antonio receives about a dozen subfreezing nights each year, typically seeing some sort of wintry precipitation about once every 2-3 winters (i.e. sleet/freezing rain), but accumulation and snow itself are very rare. Winters may pass without any freezing precipitation at all, and up to a decade has passed between snowfalls in the past. According to the National Weather Service, there have been 31 instances of snowfall (a trace or more) in the city in the past 122 years, about once every four years. Snow was most recently seen on February 4, 2011 when a half an inch of snow coated the city. In 1985, the city received a record snowfall of Script error: No such module "convert"..
San Antonio and New Braunfels, forty miles to the northeast, are some of the most flood-prone regions in North America. The October 1998 Central Texas floods were one of the costliest floods in United States history, resulting in $750 million in damage and 32 deaths. In 2002, from June 30 to July 7, 35 inches of rain fell in the San Antonio area, resulting in widespread flooding and 12 fatalities. Instances of tornadoes within the city limits have been reported as recently as October 2011, although they seldom occur. An F2 tornado will land within 50 miles of the city on average once every five years. San Antonio has experienced two F4 tornadoes, one in 1953 and another in 1973. The 1953 tornado resulted in two deaths and 15 injuries. In San Antonio, July and August tie for the average warmest months, with an average high of Script error: No such module "convert".. The highest temperature ever to be recorded was Script error: No such module "convert". on September 5, 2000. The average coolest month is January. The lowest recorded temperature ever was Script error: No such module "convert". on January 31, 1949. May, June, and October have quite a bit of precipitation. Since recording began in 1871, the average annual precipitation has been Script error: No such module "convert"., with a maximum of Script error: No such module "convert". and a minimum of Script error: No such module "convert". in one year. Natural vegetation in the San Antonio area (where undisturbed by development) includes oak-cedar woodland, oak grassland savanna, chaparral brush and riparian (stream) woodland. The San Antonio area is at the westernmost limit for Cabbage palmetto (Sabal palmetto). In addition, 63.2% of the city's population was of Hispanic or Latino origin, of any race. According to the 2000 US Census, the city proper had a population of 1,144,646, ranking it the ninth-most populated city in the country. Due to San Antonio's low density rate and lack of significant metropolitan population outside the city limits, the metropolitan area ranked just 30th in the US with a population of 1,592,383. Subsequent population counts, however, indicate continued rapid growth in the area. As stated above, the 2010 US Census showed the city's population at 1,327,407, making it the second most-populous city in Texas (after only Houston), as well as the seventh most-populous city in the United States. The 2011 US Census estimate for the eight-county San Antonio–New Braunfels metropolitan area placed its population at 2,194,927 making it the third-most populous metro area in Texas (after Dallas-Fort Worth metroplex and Houston Metropolitan Area) and the 24th-most populous metro area in the US. The metropolitan area is bordered to the northeast by Austin–Round Rock–San Marcos, and the two metropolitan areas together combine to form a region of over 4.1 million people. The age of the city's population distributed as 28.5% under the age of 18, 10.8% from 18 to 24, 30.8% from 25 to 44, 19.4% from 45 to 64, and 10.4% who are 65 years of age or older. The median age is 32 years. In San Antonio, 48% of the population are males, and 52% of the population are females. For every 100 females, there are 93.5 males. For every 100 females age 18 and over, there are 89.7 males. with San Antonio and US ranks. Located about 10 miles northwest of Downtown is the South Texas Medical Center, which is a conglomerate of various hospitals, clinics, and research (see Southwest Research Institute) and higher educational institutions. The city is also home to one of the largest military concentrations in the United States. The defense industry in San Antonio employs over 89,000 and provides a $5.25 billion impact to the city's economy. Over twenty million tourists visit the city and its attractions every year, contributing substantially to the city's economy, primarily due to The Alamo and Riverwalk. The Henry B. Gonzalez Convention Center alone hosts more than 300 events each year with over 750,000 convention delegates from around the world. Tourism employs 94,000 citizens and makes an economic impact of over $10.7 billion in the local economy as revealed in the Economic Impact Study conducted every two years by the San Antonio Tourism Council and the research team of Dr. Richard Butler and Dr. Mary Stefl of Trinity University. Tourism also brings new annual revenues to the City of San Antonio and other governmental entities with the hotel & motel tax, sales taxes and other revenues from hospitality agreements and contracts. This number exceeded $300 million in 2012. San Antonio is home to six Fortune 500 companies: Valero Energy Corp, Tesoro Corp, USAA, Clear Channel Communications, NuStar Energy and CST Brands, Inc.. H-E-B, the 14th largest private company in the United States is also headquartered in San Antonio. Other companies headquartered in San Antonio include: Bill Miller Bar-B-Q Enterprises, Carenet Healthcare Services, Eye Care Centers of America, Frost Bank, Harte-Hanks, Kinetic Concepts, NewTek, Rackspace, Taco Cabana and Whataburger. Other large companies that operate regional headquarters in the city include: Nationwide Mutual Insurance Company, Kohl's, Allstate, Chase Bank, Philips, Wells Fargo, Toyota, Medtronic, Sysco, Caterpillar Inc., AT&T, West Corporation, Citigroup, Boeing, QVC, and Lockheed Martin. San Antonio has lost several major company headquarters, the largest being the 2008 move of AT&T Inc. to Dallas "to better serve customers and expand business in the future". In 1997 Titan Holdings and USLD Communications had sold their operations to larger companies. After a Los Angeles buyout specialist purchased Builders Square, the company's operations were moved out of San Antonio. In 2013, San Antonio ranked No. 11 on Forbes' list of the Best Places for Business and Careers, with a ranking of 9th best market for job growth. San Antonio is a popular tourist destination. The River Walk, meanders through the Downtown area, is the city's second most visited attraction. It was one of the first restorations of an urban river. Lined with numerous shops, bars, and restaurants, as well as the Arneson River Theater, this attraction is transformed into an impressive festival of lights during the Christmas and New Year holiday period, and is suffused with the local sounds of folklorico and flamenco music during the summer, particularly during celebrations such as the Fiesta Noche del Rio. Also based along the River Walk is the newly restored Aztec On The River, the only surviving exotic-themed movie palace in Texas. The Downtown Area also features Cathedral of San Fernando, The Majestic Theatre, HemisFair Park (home of the Tower of the Americas, and UTSA's Institute of Texan Cultures), La Villita, Market Square, the Spanish Governor's Palace, and the historic Menger Hotel. On the northern side of the Alamo complex, beside the Emily Morgan Hotel, is the San Antonio Cavalry Museum, which features cavalry artifacts and exhibits and is frequented by local re-enactors. The Fairmount Hotel, built in 1906 and San Antonio's second oldest hotel, is in the Guinness World Records as one of the heaviest buildings ever moved intact. It was placed in its new location, three blocks south of the Alamo, over four days in 1985, and cost $650,000 to move. SeaWorld, located Script error: No such module "convert". west of Downtown in the city's Westover Hills district, is the number 3 attraction. Also, there is the very popular Six Flags Fiesta Texas. Other popular theme parks in San Antonio include Splashtown and Morgan's Wonderland, a theme park for children who have special needs. San Antonio is home to the first museum of modern art in Texas, the McNay Art Museum. Other art institutions and museums include ArtPace, Blue Star Contemporary Art Center, Buckhorn Saloon & Museum, San Antonio Museum of Art, Say Si, The Southwest School of Art, Texas Rangers Museum, Texas Transportation Museum, and Witte Museum. Visitors can also experience something of the cowboy culture year round, and they can see the 40-foot (12 m) tall cowboy boots at North Star Mall. Other places of interest include Brackenridge Park, the Japanese Tea Gardens, the missions of the San Antonio Missions National Historical Park, the San Antonio Zoo, and The Woodlawn Theatre. San Antonio's historic River Walk extends some 2½ miles, attracting several million visitors every year. The Shops at La Cantera is a non-enclosed shopping mall located near the University of Texas at San Antonio in the northwestern portion of the city. In the fall of 2013, Bexar County opened BiblioTech - Bexar County's Digital Library, the nation's first bookless library. It serves the city of San Antonio and Bexar County. The AT&T Center is also home to the San Antonio Rampage of the American Hockey League and the San Antonio Stars of the WNBA, both owned by the Spurs organization. San Antonio is home to the Double-A San Antonio Missions who play at Nelson Wolff Stadium and are the minor league affiliate of the San Diego Padres. The city got its first professional soccer team, the San Antonio Scorpions of the North American Soccer League, in 2010. They began playing in 2012 initially in Heroes Stadium pending the completion of a soccer-specific Toyota Field in the STAR Soccer Complex. The University of Texas at San Antonio fields San Antonio's only NCAA Division I athletic teams, known as the UTSA Roadrunners. The University added football in 2011, hiring former University of Miami coach Larry Coker as its initial head coach. Roadrunner football began play in 2011, with a record of 4-6. UTSA set attendance records for both highest attendance at an inaugural game (56,743) and highest average attendance for a first year program (35,521). The Roadrunners will move to the Western Athletic Conference in 2012, making the jump to Division 1 status faster than any program in history. San Antonio hosts the NCAA football Alamo Bowl each December, played among the Big XII and Pac-12 each December in the Alamodome. The city is also home of the U.S. Army All-American Bowl, played annually in the Alamodome and televised live on NBC. The Bowl is an East versus West showdown featuring the nation's top 90 high school senior football players. The game has featured NFL stars Reggie Bush, Vince Young, Adrian Peterson, and many other college and NFL stars. San Antonio has two rugby union teams, the Alamo City Rugby Football Club, and San Antonio Rugby Football Club. The city is also home to the University of Texas at San Antonio, which fields the only collegiate men's rugby team in the city. UTSA competes in Division III Texas Rugby Union. The San Antonio metropolitan area's smaller population has so far contributed to its lack of an NFL, MLB, NHL, or MLS team. City officials are said to be attempting to lure the National Football League permanently to San Antonio. Former NFL Commissioner Paul Tagliabue stated San Antonio was successful in hosting the New Orleans Saints, and that the city would be on the short list for any future NFL expansions. The city has also hosted the Dallas Cowboys and Houston Oilers preseason camps in the past, and the Cowboys practiced in San Antonio through 2011. Cowboys owner Jerry Jones acknowledged his support for the city to become home to an NFL franchise. World Wrestling Entertainment superstar Shawn Michaels was raised in San Antonio, and San Antonio is billed as his hometown during his ring entrance. The City of San Antonio runs under a Council-Manager form of government. The city is divided into 10 council districts designed to ensure equal population distribution between all districts. Each district elects one person to sit on the City Council with the mayor elected on a city-wide basis. All members of the City Council, which includes the mayor, are elected to two-year terms and are limited to four terms in total (except for those who were in office in November, 2008 and are limited to a total of two terms). Houston and Laredo have similar term limits to those in San Antonio. All positions are elected on non-partisan ballots as required by Texas law. Council members are paid $20 per meeting, while the Mayor earns $4,000 a year. Most council members maintain full-time employment in addition to their positions on the council. The current mayor is Ivy R. Taylor who was selected by the City Council after Julian Castro resigned to become Secretary of Housing and Urban Development. She is the first African American female to hold the office. The council hires the City Manager to handle day-to-day operations. The council effectively functions as the city's legislative body with the City Manager acting as its Chief Executive, responsible for the management of day-to-day operations and execution of council legislation. The current City Manager is Sheryl Sculley. The city operates its own electric and gas utility service, CPS Energy. The San Antonio Police Department (SAPD) is the city's municipal body of law enforcement. The San Antonio Fire Department (SAFD) provides the city with fire protection and EMS service. Unlike most large cities in the US, San Antonio is not completely surrounded by independent suburban cities, and under Texas state law it exercises extraterritorial jurisdiction (ETJ) over much of the surrounding unincorporated land, including planning major thoroughfares and enforcing rules for platting and subdivision. It pursues an aggressive annexation policy and opposes the creation of other municipalities within its ETJ. Nearly three-fourths of its current land area has been annexed since 1960. Involuntary annexation is a controversial issue in those parts of unincorporated Bexar County affected by it. Residents, attracted to the outlying areas by lower taxes and affordable real estate values, often see annexation as a mechanism to increase property tax rates (which are primarily driven by school district taxes, not city taxes) without a corresponding improvement in services such as police and fire protection, while the city regards its annexation policy as essential to its overall prosperity. Also, since the City has annexed a large amount of land over time, San Antonio surrounds several independent enclave cities which include Alamo Heights, Terrell Hills, Olmos Park, Hollywood Park, Hill Country Village, Castle Hills, Windcrest, Kirby, Balcones Heights, and Shavano Park. These neighborhoods are not districts of the City of San Antonio like Lincoln Heights and Brackenridge Park, but rather they are independent cities throughout the San Antonio region completely surrounded, but not directly controlled, by the City of San Antonio. San Antonio hosts over 100,000 students in its 31 higher-education institutions. Publicly supported schools include the University of Texas Health Science Center at San Antonio, the University of Texas at San Antonio, Texas A&M University–San Antonio, and the Alamo Community College District. The University of Texas at San Antonio is San Antonio's largest university. Private universities include top-rated Trinity University, St. Mary's University, Our Lady of the Lake University, University of the Incarnate Word, Webster University, Wayland Baptist University - San Antonio, Baptist University of the Américas, Hallmark University, and the Southwest School of Art which brought in its first BFA class in 2014. The San Antonio Public Library serves all of these institutions along with the 19 independent school districts within the Bexar County/ San Antonio metropolitan area. The city is also home to more than 30 private schools and charter schools. These schools include: Central Catholic Marianist High School, Incarnate Word High School, Saint Mary's Hall, The Atonement Academy, Antonian College Preparatory High School, San Antonio Academy, Holy Cross High School, Providence High School, The Carver Academy, Keystone School, TMI — The Episcopal School of Texas, St. Anthony Catholic High School, Lutheran High School of San Antonio, and Harmony Science Academy. San Antonio is also home to U.S. Air Force Basic Military Training (AFBMT). The Air Force only has one location for enlisted basic training: the 737th Training Group, at Lackland Air Force Base. All new Air Force recruits go through the same basic training at Lackland. Each year, over 35,000 new recruits go through AFBMT. In addition, METC (Military Education and Training Campus), which provides the medical training for the US military at Fort Sam Houston, hosts 30 programs and over 24,000 annual graduates. It is the largest medical education center in the world. San Antonio has one major newspaper, the San Antonio Express-News, which has served the area since 1865. The Express-News currently circulates as the largest newspaper service in South Texas. The Hearst Corporation, which owned a second newspaper, the San Antonio Light, purchased the Express-News from News Corp. in 1992 and shut down the Light after failing to find a buyer. Hearst, using the Express-News brand, also produces Conexion, a weekly magazine written by an entirely Hispanic staff with a Hispanic spin on weekly events. The San Antonio Current is the free "alternative" paper published weekly with local political issues, art and music news, restaurant listings and reviews, and listings of events and nightlife around town. In addition, the San Antonio Business Journal covers general business news. La Prensa, a bilingual publication, also has a long history in San Antonio. The San Antonio River Walk Current covers general San Antonio news. About 50 radio stations can be heard in the San Antonio area — 30 of them are actually located in the city proper. San Antonio is home to Clear Channel Communications, the largest operator of radio stations in the US. Its flagship, WOAI AM-1200, is known for its local news operation, considered among the best in the country. It is a 50,000-watt clear channel station that reaches most of North America at night. The first radio station to broadcast in South Texas was KTSA AM-550 in 1922. Some of KTSA AM-550's better known local talk show hosts include Jack Riccardi, Trey Ware and Ricci Ware. KRTU 91.7 is a non-commercial radio station based out of Trinity University. Unlike other college radio stations throughout the US, the station plays jazz 17 hours a day and college rock/indie rock at night. College Alternative station KSYM, 90.1 FM, is owned by the Alamo Community College District and operated by San Antonio College students and like KRTU it plays the Third Coast music network during the day and alternative music at night. Most Latin stations in the area play regional Mexican, Tejano or contemporary pop. On January 12, 2006, Univision-owned KCOR-FM "La Kalle 95.1" changed its format from Hispanic-Rhythmic Contemporary Hits to Spanish Oldies, then named "Recuerdo 95.1". However, Univision announced on November 10, 2006, that it flipped KLTO Tejano 97.7's format to Reggaeton in an attempt to reintroduce the format to San Antonio again. Then, 97.7 was flipped again to feature a rock format. The station no longer broadcasts anything in English and while still owned by Univision, it had broadcast music from artists such as Linkin Park, before selling the station to the Educational Media Foundation and flipping it once again to Air1. 95.1 was then flipped back to the "La Kalle" format again after being flipped more than a year ago to feature a "95X" format. KLTO was acquired earlier in the year and operated as a simulcast of KXTN-FM Tejano 107.5. San Antonio has quickly diversified in recent years, with the influx of non-Tejano Latinos, mostly from the East Coast, who are serving in the city's various military bases, as well as immigrants from Mexico. Therefore, just like in the rest of the country, radio station conglomerates have been changing formats in San Antonio to reflect shifting demographics. San Antonio-based TV stations are WOAI channel 4 (NBC), KSAT channel 12 (ABC), KENS channel 5 (CBS), KABB channel 29 (Fox Broadcasting Company), KCWX channel 2 (myNetworkTV), KMYS channel 35 (The CW) and KLRN channel 9 (PBS). The market is also home to six Spanish-language stations, three religious stations, three independent stations and one Internet-based station (210 TV). The San Antonio market has 65% cable TV penetration. The San Antonio International Airport (SAT) is located in Uptown San Antonio, about eight miles north of Downtown. San Antonio International is the 6th busiest airport based on passenger boardings in Texas. It has two terminals and is served by 21 airlines serving 44 destinations including six in Mexico. Stinson Municipal Airport is a reliever airport located six miles (10 km) south of Downtown San Antonio. The airport has three runways and it is also home to the Texas Air Museum. A bus and rubber tired streetcar (bus) system is provided by the city's metropolitan transit authority, VIA Metropolitan Transit. VIA's full fare monthly unlimited Big Pass is $35 per month. VIA began operating a Bus Rapid Transit line known as VIA Primo in December 2012, which connects Downtown San Antonio to the South Texas Medical Center, the main campus of the University of Texas at San Antonio, and the independent enclave city of Leon Valley. In August 2010, VIA Metropolitan Transit unveiled the next set of buses that are powered by diesel-electric hybrid technology. The 30 hybrid buses are being put into service on VIA's express routes to serve daily commuters across the city. This set of buses follows the introduction of new vehicles powered by compressed natural gas, which were unveiled in May 2010. In the fall of 2010, VIA will begin taking delivery of three new buses that will be powered by electricity from on-board batteries. These buses will serve the Downtown core area, and they will be the first revenue vehicles VIA operates that have zero emissions. VIA offers 89 regular bus routes and two Downtown streetcar routes. This includes express service from Downtown to park and ride locations in the South, West, Northwest, North Central and Northeast Sides of the city with service to major locations such as UTSA, Six Flags Fiesta Texas and SeaWorld. VIA also offers a special service to city events including Spurs games and city parades from its park and ride locations. VIA has, among its many routes, one of the longest local transit routes in America. Routes 550 (Clockwise) and 551 (Counterclockwise) travel Script error: No such module "convert". one way as it loops around the city. Interstate 410: Connally Loop—simply called Loop 410 (four-ten) by locals is a Script error: No such module "convert". inner beltway around the city. US 90: Cleto Rodriguez Freeway (West) through Uvalde and Del Rio to its western terminus at I-10 in Van Horn. Prior to I-10 East and US 90 West expressway being built US 90 traveled through the west side via West Commerce St. (westbound) and Buena Vista St. (eastbound) and Old Hwy 90. On the east side it traveled along East Commerce St. to its current alignment which runs concurrent with I-10 East to Seguin. US 281: McAllister Freeway (North) to Johnson City and Wichita Falls. Southbound, it runs concurrent with I-37, then I-410 for Script error: No such module "convert"., then heads south to Pleasanton. Prior to I-37 and McAllister Fwy. being built US 281 traveled through the north side via San Pedro Ave. and the south side via Roosevelt Ave. US 87: Southbound to Victoria along Roland Avenue then Rigsby Avenue. It runs concurrent with I-10 for Script error: No such module "convert". where it goes to San Angelo northbound. US 181: Starts Script error: No such module "convert". south of I-410/I-37/US 281 interchange and heads toward Corpus Christi via Beeville. Prior to I-37 being built, US 181 traveled along Presa St. from Downtown to its current alignment. State Highway 16: From Freer, it runs concurrent with I-410 for Script error: No such module "convert". along southwest San Antonio, over to Bandera Road to Bandera. State PA 1502 (Wurzbach Parkway): Limited-access, high speed road parallel to north IH-410. No frontage roads (to limit development and subsequent local traffic). By 2015 will connect north I-35 and north I-10 across the north side of town. San Antonio has about Script error: No such module "convert". of bike lanes, routes or off-road paths. Off-road trails travel along the San Antonio River, linear greenways, or city parks. Although largely disconnected, the progress to create a bicycle-friendly environment was recognized when San Antonio was designated a Bronze-Level Bicycle Friendly Community by the League of American Bicyclists. 40x40px Wikivoyage has a travel guide for San Antonio. ^ a b c Adina Emilia De Zavala (December 8, 1917). "History and legends of The Alamo and others missions in and around San Antonio". History legends of de Zarichs Online. p. 8. Retrieved June 2, 2014. ^ "San Antonio: The City of St. Anthony - June 2004 Issue of St. Anthony Messenger Magazine Online". Americancatholic.org. Retrieved 2010-06-30. ^ "Texas - Race and Hispanic Origin for Selected Cities and Other Places: Earliest Census to 1990". U.S. Census Bureau. Retrieved April 21, 2012. ^ "File:Climatemapusa2.PNG - Wikimedia Commons". Commons.wikimedia.org. Retrieved March 6, 2013. ^ a b "NowData - NOAA Online Weather Data". National Oceanic and Atmospheric Administration. Retrieved 2011-12-23. ^ "San Antonio Suffers Worst Snowfall". Schenectady, NY: Schenectady Gazette, via Google News. United Press International. January 12, 1985. ^ "Tornado rakes S.A. neighborhood". ^ "Annual Estimates of the Resident Population for Incorporated Places of 50,000 or More, Ranked by July 1, 2013 Population: April 1, 2010 to July 1, 2013 - United States -- Places Over 50,000 Population". Retrieved 2014-05-05. ^ "1990 Population and Housing Unit Counts: United States (CPH-2)" (PDF). Retrieved 2008-08-11. ^ "San Antonio (city), Texas". State & County QuickFacts. U.S. Census Bureau. Retrieved April 21, 2012. 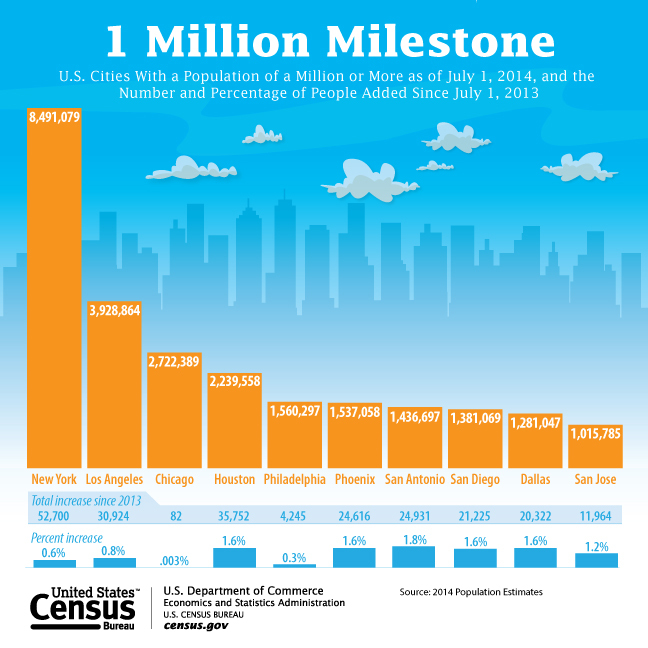 ^ Census 2000: Metropolitan Areas Ranked by Population, U.S. Census Bureau. ^ [dead link], U.S. Census Bureau. ^ American FactFinder, United States Census Bureau. "San Antonio city, Texas - ACS Demographic and Housing Estimates: 2006–2008". Factfinder.census.gov. Retrieved 2010-06-30. ^ "Welcome to the City of San Antonio Economic Development Department-Index". Sanantonio.gov. Retrieved 2010-06-30. ^ San Antonio Tourism, San Antonio Riverwalk.com. Retrieved January 7, 2007. ^ "America's Largest Private Companies". Forbes.com. March 25, 2014. Retrieved 2014-03-25. ^ "Best Places For Business and Careers - Forbes". Forbes. Retrieved 14 January 2014. ^ a b "Nation's first bookless library opens in San Antonio". Dallas Morning News. January 3, 2014. ^ "Welcome to the 2009 U.S. Army All American Bowl". Usarmyallamericanbowl.com. Retrieved 2010-06-30. ^ Football: Cowboys returning to S.A. in '07[dead link], San Antonio Express-News, April 1, 2006. ^ Football: Cowboys' Jones backs S.A. team[dead link], San Antonio Express-News, May 5, 2006. ^ "City of San Antonio | Official Web Site - City Council". Sanantonio.gov. Retrieved 2010-06-30. ^ San Antonio Master Plan, Public Studio (San Antonio Chapter American Institute of Architects). Retrieved January 7, 2007. ^ Three-year annexation plan (PDF), City of San Antonio Planning Department, January 6, 2006. ^ "Parole Division Region IV[dead link]." Texas Department of Criminal Justice. Retrieved on May 21, 2010. ^ "San Antonio District Office." Texas Department of Transportation. Retrieved on January 11, 2010. ^ "Post Office Location - SAN ANTONIO[dead link]." United States Postal Service. Retrieved on May 22, 2010. ^ "Bexar County School Districts". Bexarcountytexas.us. March 30, 2008. Retrieved April 20, 2013. ^ Designated Market Areas, Nielsen Media Research. ^ "Amtrak's Texas Eagle | Welcome aboard!". Texaseagle.com. Retrieved 2010-06-30. ^ "Routes - California". Amtrak. Retrieved 2010-06-30. ^ "Sunset Station San Antonio near the Convention Center, Alamo and River Walk Hotels". Sunset-station.com. Retrieved 2010-06-30. ^ Transportation Planning and Programming Division. "State Highway Loop No. 345". Highway Designation Files. Texas Department of Transportation. ^ Transportation Planning and Programming Division. "State Highway Loop No. 368". Highway Designation Files. Texas Department of Transportation. ^ Transportation Planning and Programming Division. "State Highway Loop No. 353". Highway Designation Files. Texas Department of Transportation. ^ a b c d e f g h i j Sister Cities Program. Sainternationalrelations.org. Retrieved on 2011-12-11. ^ "Mayor announces Chennai, India Sister City Agreement". Sanantonio.gov. 2008-02-28. Retrieved 2010-06-30. ^ The Greater San Antonio Chinese Chamber of Commerce - Wuxi and Suzhou Are Friends with San Antonio. Gsaccc.org (2010-05-28). Retrieved on 2011-12-11. ^ San Antonio mayor boosts ties with Israel | JTA - Jewish & Israel News. JTA (2011-07-14). Retrieved on 2011-12-11. The University of Texas at San Antonio houses a collection of papers by John Kight that documents the history of mass transit in San Antonio. "San Antonio". U.S. City Open Data Census. UK: Open Knowledge Foundation.